The Slowly Boiled Frog: LifeSiteNews goes after Ivanka and hubby as "pro-homosexual"
LifeSiteNews goes after Ivanka and hubby as "pro-homosexual"
Donald Trump’s daughter Ivanka and her husband, Jared Kushner, are being credited in the media for sinking a potential Trump executive order designed to protect the freedom of conscience for people of faith. The power couple, though identifying as Orthodox Jewish, have a history of supporting homosexual activism, including co-hosting a fundraiser for a leading pro-homosexual “marriage” group in 2011. While Trump is certainly capable of the most odious actions towards LGBT people, that early-stage draft is inconsequential, at least for now. The source of Ivanka's intervention was Politico which is fairly reliable. In other words Ivanka might have stopped something that wasn't under serious consideration. This is all part of the erratic irrational madness of Trump-world. Some of the chaos is intentional. It is by design to keep people disoriented. Trump insiders might have intentionally leaked that draft. Who knows? 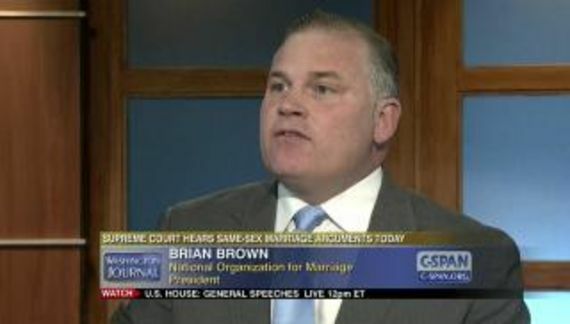 Brian Camenker, a pro-family advocate who attends an Orthodox synagogue in Newton, Massachusetts, told LifeSiteNews, “You can’t be serious as an Orthodox Jew and support the gay agenda.” Camenker is the president of Mass Resistance, a national group that fights the LGBT agenda. Doubtful. Camenker does not wear the skull cap required of orthodox Jews. In their new roles as two of the most important advisers in Washington to the new president, Ivanka and Kushner will be expected to publicly reconcile their “Orthodox” Jewish beliefs with their pro-homosexual advocacy and its required suppression of Christian religious freedoms and rights of conscience for all Americans. What a crock of crap. Gay rights do not suppress Christian religious freedom unless someone's idea of freedom is the freedom to discriminate in public accommodations. 50 years ago they said comparable things about equal protection for Jewish people. Some of them still do. In 1964 it became unlawful for them to discriminate on the basis of religion. Some of them still do. Shame on LifeSiteNews for giving a voice to the lunatic fringe including two hate group leaders in one post. Monday's post about Steve Jalsevac, managing director of LifeSiteNews.com puts things in perspective. Jalsevac is a loony conspiracy theorist.